This week finds National City in the middle of an alien invasion after Rhea pulls a bunch of Daxam ships from the fluctuating story anomaly they’ve been hiding in all season. I thought Daxam got exploded? I thought Daxam was a wasteland with citizens crying out for help? I thought Daxam was in chaos? I thought Daxam’s citizens had scattered across the universe? ALL THE ABOVE, PAL. The truth of Daxam is a series of juggling balls in the hands of an evil clown and I’m too dizzy to care anymore. So whatever, they’re in Earth’s atmosphere — on hundreds, if not thousands, of ships, so they seem to be doing pretty well for a race from a dead planet — and Rhea wants to make Earth the new Daxam, so the old version of this awful empire doesn’t even matter anymore. After the events of last week, Lena Luthor wakes up to find herself on a Daxam ship, with Queen Rhea leaning over her and making promises to create a world worthy of Lena. Listen, I’m morally opposed to Rhea, her crazytown bananapants personality, and her murderous methodology, but creating a world worthy of Lena Luthor is a plan I can get behind. Just a pity that a full-scale alien invasion and an arranged marriage to Mon-El are part of Rhea’s scheming. Speaking of a full-scale invasion: Daxam soldiers are attacking National City, including attacking the police and the DEO! I only mention this in its own paragraph because this initial attack leads to what is quite possibly my favorite sequence in this show’s whole second season: Alex Danvers fleeing from hostile Daxam soldiers, jumping backwards (and in slow motion!) over a balcony while firing her cool alien gun, and being swiped from the air by Supergirl. Even if this episode were completely awful, which it’s not, that scene would still be awesome enough for me to ignore the failing areas and give “Resist” a pass. This review can’t just be Alex’s amazingness in GIF form over and over, though, so I guess I need to actually describe the plot. While forces on the ground get so overwhelmed by Daxam soldiers that Team Supergirl has to move their headquarters from the DEO to the secret alien bar (that everyone knows about), Mon-El and Lena are up in the Daxam mothership with Mon-El’s Daxam mother. As previously mentioned, Rhea wants Mon-El and Lena to marry so that she can get an heir and establish an Earth/Daxam connection — something I don’t really get, since this is an invasion and political marriages are usually used to avoid this sort of thing. Rhea gets Lena to agree to the marriage by threatening children’s homes and hospitals and I guess Mon-El agrees because Lena agrees? He spends most of this episode going along with everything, like an ambulatory shrug emoticon. The first of a few surprise appearances occurs back in Team Supergirl Temporary HQ: Lillian Luthor shows up! 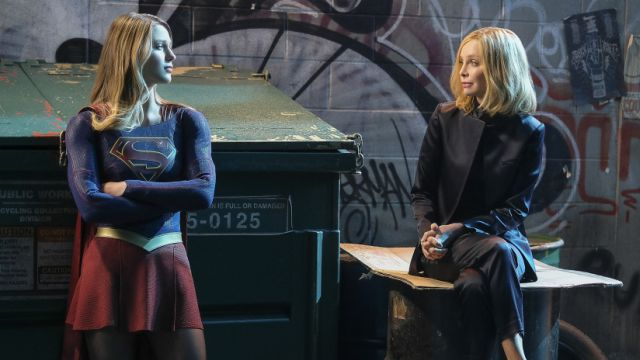 In a pretty bizarre narrative decision, the Supergirl writers spend time underlining the fact that their ultra-evil, xenophobic villain was right all along: Lillian’s worst nightmare of a full alien invasion is occurring, and now they could use her help. Considering that Lillian’s whole storyline was a pretty obvious anti-immigration allegory in which she was meant to be seen as a racist nutjob, I don’t know what Supergirl is trying to say here. Letting people in will end exactly how the xenophobes say it will? Immigration screenings and restrictions are a great idea? Don’t read too much into dumb comic book shows on the CW network, even when the dumb comic book shows try using social issues as key plot elements? Hard to say, since even the DEO appears to be ignorant of her being an alien. Everyone seems shocked, except Cat Grant, who just hopes the president is still a Democrat. Also, we get more dialogue about how invading forces utterly destroy native people who “hope for the best” because that’s what happened to the president’s world, and... is this metaphor no longer about immigration? Considering the Cat Grant speech about resistance we get later, this may have shifted into a metaphor about how we can’t all just hope for the best while people in power take away our rights. Which, kudos to the writers for keeping with the times, but I still feel like some messages were blurred in this episode. The president's story of her planet's enslavement comes with a dramatic declaration: use a positron cannon to destroy the Daxam mothership, even though Lena and Mon-El are still on board. No one — Kara especially — likes the idea of blowing up two innocents, but since it's the president giving the order, Alex (acting as DEO director with J'onn out of commission from the fight with Rhea) must obey. They do devise a terrifying plan after some deliberation, but the cannon will be fired at a certain time regardless of who is still on board, even if that person is Kara, who will be in charge of the rescue. Meanwhile, Cat Grant's job is to inspire people this episode. She inspires Kara to go with her instincts to save Lena and Mon-El from the ship by telling her it's the connections we make that lead to happiness, and those connections are important. Then she inspires everyone in the city with a transmitted message that also acts as an uplifting title drop: “Resist. Resist these invaders with everything you’ve got.” Cat goes on to say that it's the people's turn to be superheroes by standing up for what's good and right, and yep. Definitely a different allegory now. For real, though, I've missed Cat Grant. No one gives a rousing speech quite like she does. The Daxam soldiers come in as Cat Grant is wrapping up her speech and there’s a moment where she accepts her imminent demise, but Guardian leaps through the window and actually does stuff! Stuff related to the main plot of the episode! Wow, that’s something I wish we’d seen more of this season! Anyway, Cat knows Guardian is James and I just assume she’s pretending not to recognize Kara as Supergirl at this point. I’m assuming everyone’s pretending — Lena, Cat, I would say Lillian Luthor but she actually admitted to knowing it. Yeah, the premise of the glasses being a decent disguise is so dumb, they just have to be humoring her. A switcheroo results in Kara going up to the Daxam ship to save Lena and Mon-El with Lillian’s help, then getting trapped along with Mon-El when Lillian predictably double-crosses them. Kara uses a hacked Hank Henshaw to teleport Mon-El back down to Earth and he goes with it because ambulatory shrug emoticon, while Kara stays to talk some sense into Rhea. It goes about as well as you might think, so long as you think it doesn’t go well at all. Everything Cat Grant says in this episode deserves to be quoted here. Lillian predicts that Lena will hate Kara for lying to her about being Supergirl and pleeeease, no no don’t do that plot. I don’t want to say this is all Mon-El’s fault, but it wouldn’t be happening if he’d just gone back with his parents, so... this is all Mon-El’s fault.